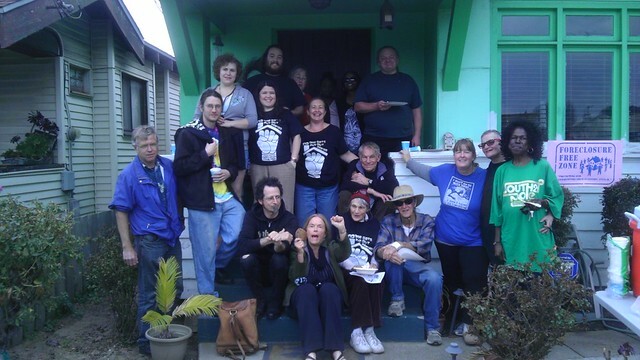 We are Occupy Oakland Foreclosure Defense Group. We defend homeowners against foreclosure. We don’t do it for money. We do it because an injury to one is an injury to all, and because the banks should not be able to get away with theft. We are very low budget, but we do need to keep our text alert line and our hotline open. Please contribute what you can. With heavy hearts, we here at FDG have two announcements to make. Our member and friend, Jodie Randolph has won one battle and lost another. As many of you know, Jodie was not only fighting for her home but fighting against cancer. Early Saturday morning that fight ended when Jodie passed away. We will announce details for the memorial service as we get them. But in these last months, she knew though that together we had won the fight for her home. After 8 months of defending the home and fighting Morgan-Stanley, we have won on every demand and the ink is practically dry on paperwork securing the house. The home now passes to her family, the deal stands … and indeed stands as testament to her fierce fighting spirit. These past few months, a celebration was being planned to mark the win and reunite all who had a hand in this fight, who took shifts at the house, who called and wrote, who canvassed and flyered , who shut down Morgan Stanley’s offices in San Francisco and Oakland, and locked down a fifty-two story skyscraper with Jodie. At the behest of the family, in addition to the memorial, the celebration will still be held. It will be more than a celebration of resistance and a fight won; it will be a celebration of Jodie, her life and spirit. Details to follow as we figure them out. Home defenders’ thank-you barbecue report. The skies were cloudy, the temperature was perfect, and on Day 118 of the defense of Jodie Randolph’s home, many of the home defenders gathered to pat ourselves on the back, eat good food, and catch up with each other. The first batch of our stylin’ t-shirts was distributed to volunteers. You can see some of the shirts (clenched fist under a roof) in this picture. Jodie is deep in negotiation with Morgan Stanley and we’ve got her back! We’re looking forward to a victory party not too long from now. On March 8, we held our second training on foreclosure, gentrification, and displacement. The trainings are designed to provide the tools that we and our allies need to do this work. I love what you are doing. Keep this movement going, and it will spread to even more places. I wish I could meet every one of you. You are true heroes – the real thing. Hello I need HELP..finding an attorney because chase took my rental property without giving me any paper work I was waiting of a modifacation and now the state is requesting I send in the form to get $875.00 I need HELP PLEASE???? CHASE pulled a 211 on me and I cant get but $875.